MOTs are done by appointment in a dedicated test bay. We can test your vehicle one month before it is due, the extra month is added on to your certificate," you don't lose out." 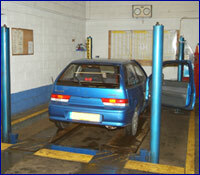 It is required by law that all vehicles over 3 years old have a valid MOT certificate. This is to ensure that vehicles are not a danger to both the owner and the general public. The test covers most aspects of the cars safety including brakes,steering, lights, and general condition of the vehicle. The purpose of the MoT test is to ensure the vehicle meets the minimum safety level required by law.